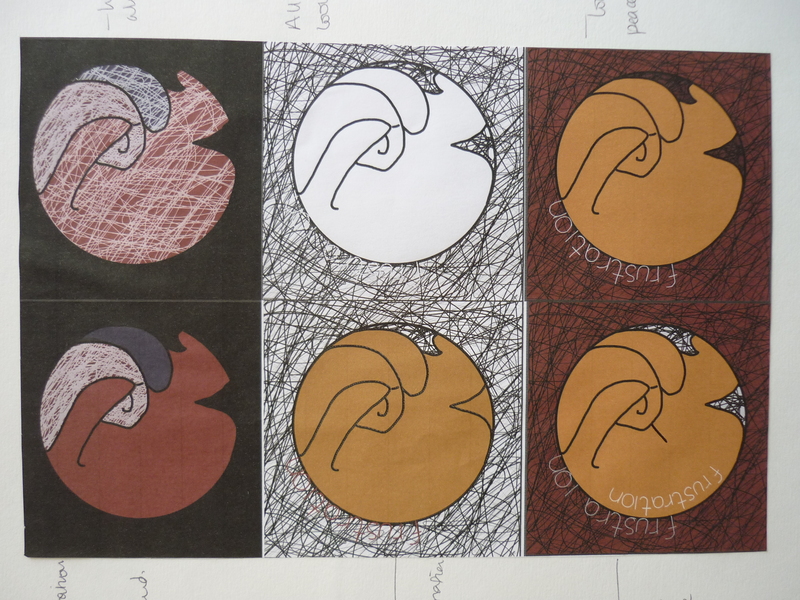 This was the first initial sketch that was very rough and may not make sense but I felt I could work from this shape. I first messed around with colours and biro to see what I could look like in a larger scene. 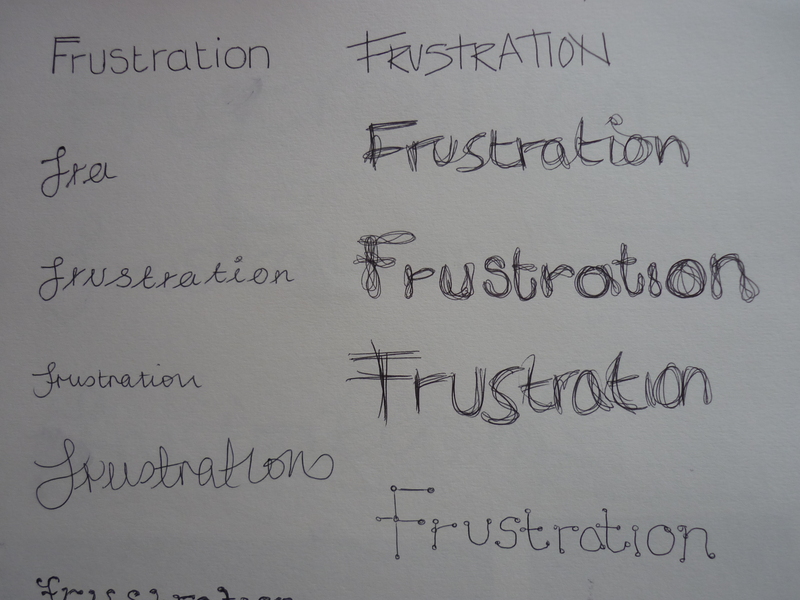 Using watercolours I chose the colours that people said they associated with the word frustration. 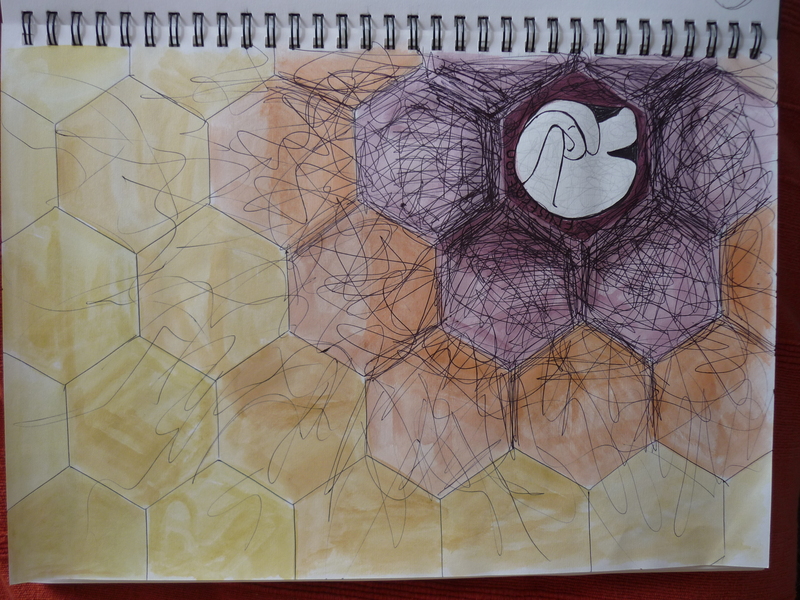 I placed the hexagons around as it linked with the text but also it looks like he is trapped within a hexagon. I think it’s not amazing but it’s different and I may refer back to it in the future. I am now showing some of the final pieces for the logo. This is a section of the text I was experimenting with, on the left there are the neat styles and on the right the messy styles. I felt that the messy styles communicated better as the smooth lines on the left felt like that it was communicating calm and smoothness. So now that I had a mini go I placed it within the image. At first I placed the text as one single word but when I’m frustrated I feel like things are building up, surrounding me so I started to place the text around the figure. I placed the lines still within the character but changed the density so the head sands out more. 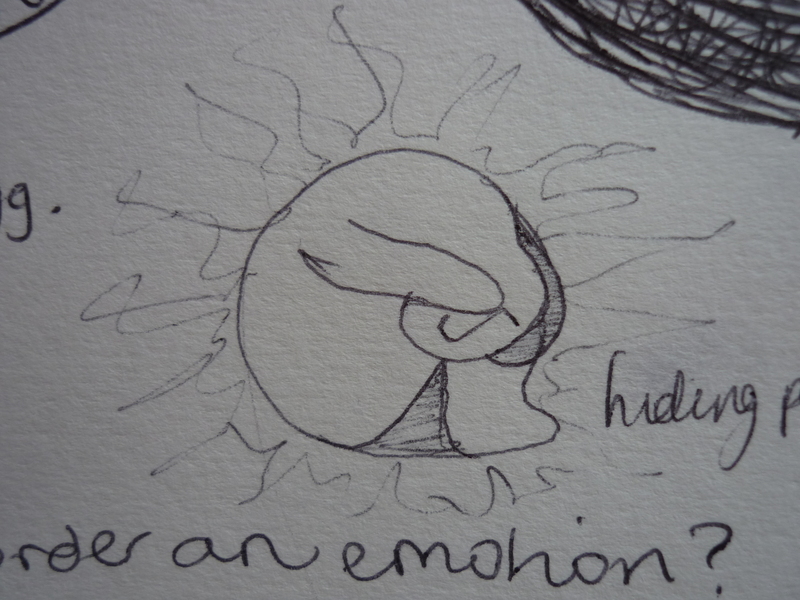 I also placed a scribbly brain within its head to emphasise thats his head. The background was originally black but I realised it needed some texture so I used a piece that I created earlier on. I like the piece as I feel like it shows the part before some flips out with frustration. Originally there wasn’t any lines under the chin to show the legs and I remembered one of the rules which was to ask others to see what they thought. I did and they commented how they couldn’t work out what it was until I put that line in, I couldn’t see this before as I obviously already knew what it was. With this one I placed hexagons in the background to link it with the text but again I don’t know if I need then and one of the rules were not to put in anything you couldn’t justify. Hmm tricky because I think it looks like a hole they are falling into the texture in the previous image has more texture. For the brain I placed a white scribble line to show pureness and a red scribble that is working it’s way through building up like the emotion does. The text isn’t surrounding him but I think it would be hard to fit it in with hexagons creating odd angles. Overall, I quite like the outcome as I have tried to incorporate what I have learnt and create a difficult emotion to express. It’s not the best logo and would require a lot of alterations if it was a formal one but for a days work not bad! I remember one of the rules was simplicity can be best, this clearly isn’t a simple design with the variety of layers but if I had time to have another go I would try and make a more refined and simplified one. I realised creating a logo is really hard! It’s not like school where you do a scribble and cloud it in and it’s fabulous. A lot of time and effort needs to be expelled when creating one and I take my hat off to anyone who creates them. This entry was posted in Logo in a day.